While the rest of the world was in England last week for the royal wedding, I was in the French Alps! er, I mean Apps. 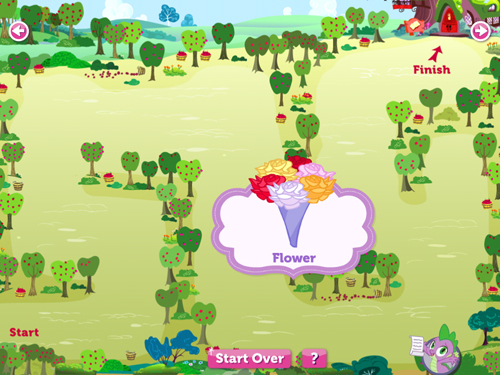 I had a chance to try out two nifty French-themed kids apps, and I think you’ll like them too. Word Wagon: Kids spell words by dragging the letters in place. The first app is Word Wagon by Duck Duck Moose, an award-winning developer of educational game apps for kids. This app is all about spelling words and is designed for youngsters just learning to read. A cute little rodent named Mozz lives under the Eiffel Tower (and he wears a beret!). He and his bird friend Coco guide kids through each word. I really liked the artwork, French-themed music and animation, and I also like the fact that the letters are mentioned by name and pronounced as they should sound in the word. When the word is formed correctly, it is spoken and then the word is collected in the wagon. Kids can see how many words they’ve formed, and along the way they collect stars which can be used to form constellations. There are four levels of difficulty in the app, which is nice because each of my two kids can enjoy the app at their own ability level. 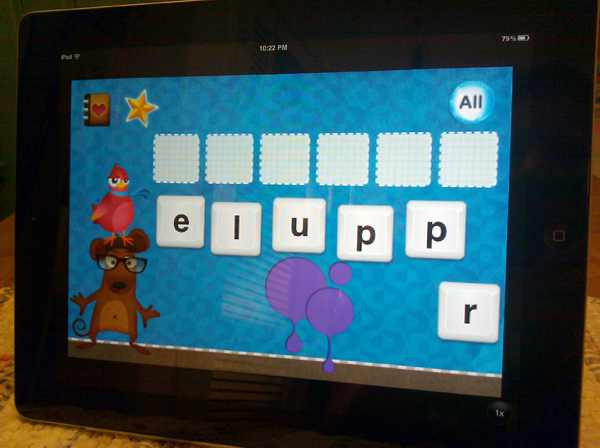 While definitely an educational app, Word Wagon is well designed and makes learning spelling and phonics fun. It’s $1.99 and is designed for the iPhone, although it looks great at 2x on my iPad. GoKids Apps: Save Paris! is a clever app for older kids by Fun Educational Apps. You are tasked with saving Paris from evil alien invaders who are focused on ‘Glooping’ everything in sight! Your mission is to learn about France and Paris, and then use your new knowledge by pairing facts with their definitions in a match card game. If you miss too many it’s Game Over. If not, you’ll be rewarded with a fun ‘whack-a-mole’ game, where the object is to tap on the aliens as fast as they pop up. I admit I went through only the first three missions of ten. The material covered is wonderfully comprehensive and includes geography, language, culture, history and more. This would be a fantastic resource for kids 8-12, especially those who are visiting France, taking French or doing a unit on France in geography or history class. But the alien invasion theme and the game action would probably draw kids back just for that aspect of the app. With high-quality art, music and gameplay, GoKids Apps: Save Paris! is a crash course in French culture sandwiched between top-secret missions to defeat green Gloop aliens. What’s more fun than that? Find it in the App Store for $1.99. A few months ago I downloaded the Lite (free) version of the Global Dinamika Informatika app iWriteWords and was so impressed, I bought the full version right away. Why do I like this app? Mostly because it just makes learning fun. It’s a handwriting practice app where the user is guided by a cute little crab who squeaks when you lead him off the numbered track. In the full version, kids can choose from writing numbers, uppercase letters, lowercase letters and a selection of short words in either uppercase or lowercase letters. 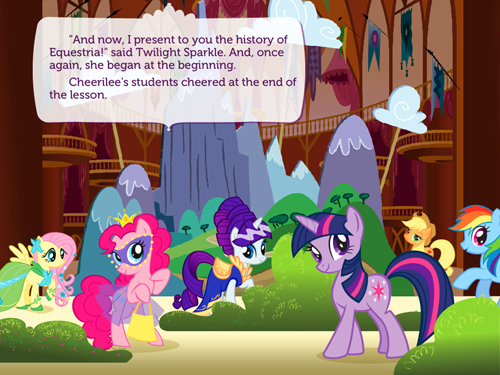 I have tested this app with both my two girls (4 and 5 years old) as well as a 6-year old student I tutor. All were delighted with it and were disappointed when ‘playtime’ was over. I find my girls returning to this one on their own during their free iPod time. Here’s the app trailer, for those who have not yet discovered this one. Try out the Lite version here, and snag the full version here. In my family, we honor silliness and made-up words. For instance, when I was a toddler, I called my parents ‘Rushmore.’ No one knows why, least of all me. Of course this stuck like glue to my family’s lexicon, and for years my parents called each other ‘Rushmore’ as a term of endearment. Much later, my husband and I started using ‘fordor’ as a cuss word around our son, as a way to avoid using actual four-letter words in his presence. It’s been so long ago that I have no idea where the word came from or how; only that it’s still in use around our house today. Do you use made-up words in your household?